Nestled among the hills between Arni and Vellore is the village Padai-veedu. This beautiful pastoral village was once the capital of Sambuvarayar Dynasty and was also a grand commercial centre. Encircled by mountains and hills, this place consists of 17 villages. Padai-veedu is one of the most important 'Sakthi Sthalas' in Thondainadu (a part of Tamil Nadu). 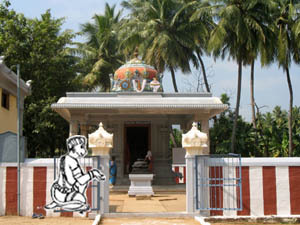 Goddess Renugambal is self-manifested in this place, indicating "Sakthi is everything in this world" and offering her blessings along with Brahma, Vishnu and Lord Siva. In this place a number of sages performed penance and attained salvation. The existence of Banalingam and Nanakarshna Chakra consecrated by Adi Sankarar is the specialty of this place. The universal mother Uma Devi was born to Maharaja of Eraivadha and was named Renugai. After attaining the marriagable age according to the customs of those times, Renugai traveled the whole world accompanied by her friends and an army in search of a suitable husband. At last she arrived at Kundalipuram, where saint Jamathakni was doing penance. Since Renugai camped near the Ashram with her soldiers, the sacred place was named "Padai Veedu" (army encampment). "Padaiveedu" is now called as "A.K.Padavedu (Amman Koil Padavedu)". Here, Renugai saw Saint Jamathakni. Padavedu is the birth place of Parasurama, one of the reincarnations of Mahavishnu. The main temple in Padavedu is that of Renukambal Thaiyaar. Lore has it that the history of the place dates back to several yugas and is the place where Sage Jamdagni and his wife Renuka the daughter of Iravadha were living in a hermitage. The story of Rama is intricately woven with the story of Renukamabal at Padavedu. This explains the presence of Anjaneyar in this area. Reincarnation of Mahavishnu as Rama took place. He defeated Ravana and started back with Sita Devi to Ayodhya. A divine voice informs Rama about Sadhmukha Ravana who still lives under the milky ocean. He was to be fought and defeated along with other demons associated with him. While the war was on, Sita Devi saw things with her wisdom eye. Sita Devi called Hanuman and informed him that Ravana was a devotee of Renuka devi. And that the pith of his life was in the center of the lotus protected by beetles in the center of a lotus pond in the city of Kundali. So Hanuman arrived at Kundalipuram to collect the pith so that they could destroy Ravana. However this was not easy since Mother Renuka Devi was protecting her devotee’s life. It ensued that Hanuman and Reunka Devi engaged in a battle. The lands of Kundalipuram were cursed by Hanuman to change to sand and Reunka Devi cursed Hanuman to be transformed into 100 stones. Shri Rama became aware of this happening through his wisdom eye and arrived at Kundalipuram to intervene and bring peace. Hanuman and Rama offered prayers to Mother Renuka devi and when she gave darshan, Rama requested her help to fulfill the divine ordain of annihilating Ravana. Located close to the Shakti stalam of Renukambal in Padavedu is the Veera Anjaneyar temple. It is on the road to the majestic Ramar temple situated behind the Renukamba temple [and close to the Draupadhi Mandapam]. Padavedu is guarded in all eight directions by Anjaneya temples. The area has no Navagraha temples and it is said that people from the villages and forests nearby worship Anjaneya for deliverance from the slight of the planets. Story has it that Renukamabal blessed Anjaneya to appear in 100 different forms and stand guard at her temples. The Veera Anjaneyar vigraham in Padavedu has recently (in 2003) been relocated from original place along the main road to it’s present location. This Anjaneyar was in the main road without any roof or temple as a hypaethral shrine. When they wanted to move the idol of the Lord Anjaneya to the newly constructed temple, they could not. Only after adorning him with a Butter Alankaram made of about 40 kg of butter, he moved. The deity which was earlier open to the sky in now well protected with an enclosed sanctum sanctorium and compound wall surrounding the temple. The vigraham is about 8-9 feet tall. And the visage offers an almost childlike innocence to the devotee. Shri Anjaneyar here is in a side wise pose. His right hand is held high in abhaya hastam pose and the left hand is holding the tail which curves around his head. The sweep of his tail is symbolic of troubles encircling an individual and he holding the tail indicates his grace in circumventing them and thus protecting the devotee. It is a norm that devotees offer worship at Anjaneyar temple before visiting the other innumerable temples in Padavedu. It is considered auspicious to offer anna dhanam at the temple as a navagraha dosha nivaranam. TVS group has played an important role in the renovation of the temple and it’s clean and quiet atmosphere is a boon to any devotee in itself. This Anjaneyar who was standing without any roof or temple as a hypaethral shrine blessing all His devotees for centuries is now waiting for you. To be blessed by such a selfless Sri Rama devotee is itself a blessing. Make it a point to visit padavedu to gain the blessings of the Lord. and writers on her subject and also on philosophy.